problems that come my way. I don’t give up on any situation that I find myself; I have always believed that there is a way out of every problem, if I look closely, so, I want to be known and identified as a problem solver. What problem did you identify that spurred you to make a solar powered car? I noticed that there is a problem in our climate change which is a significant and lasting change in the statistical distribution of weather patterns over periods ranging from decades to millions of years and this is caused due to the effects of combustion of fuel. If we can reduce or stop combustion of fuel, this world will be a better place for us to live. Most of us are not aware of this problem, so I thought of building a car that will not use fuel for its movement. This car will not produce carbon dioxide emissions that cause change in our climate. How did you get the materials to build the car? I used the available materials I could find around to build the car. I also used my personal money for the building of the car and the little funds my parents could also provide. However, I still need more funds to perfect the work. When you wanted to start this project, what was the reaction of your friends and parents? 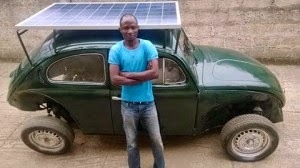 Most of my friends said that my country has not built a car that uses fuel; they wondered how I could possibly build a car that will not use fuel. They tried to discourage me but I told them that, we, the youths are the agent of change and it will start from somewhere. My parents knew the kind of person I was. They knew that I love bringing solutions to problems; they were just looking forward to how I would solve the problem. When the car moved, right in their presence, they were very happy that I said it and I did it. What kept you focused and determined? I just believed that I could do it, despite all odds. I have made up my mind that the car would be the personal car that I will be driving around town. How long did it take you to build the car? I cannot really say for now but it is more than 12 months now. This was because I initially started getting the materials in bits.